RJ SPRAY UNDERCOAT - 400CC is rated 5.0 out of 5 by 1.
RJ Undercoat made of specific binders combined with high quality solvent mixture. 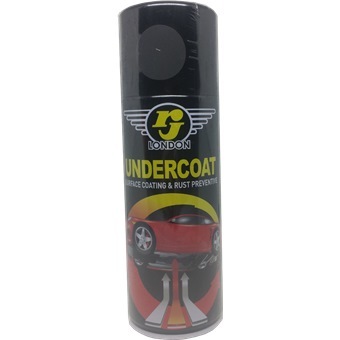 The results of the application of these products provide a coating having good adhesion, and durable. Serves as a protective layer on the bottom of the motor vehicle body, the outer door panels, floor of the ship, the bottom of the motor boat or other objects that require protection against corrosion / rusting or corrosion due to water splash caused by weather changes or extreme conditions. Theoretical coverage 0, 100 l / m2, thickness of 40 microns. Rated 5 out of 5 by carrere91188 from Great features Easy and simple to use convenient pick up location. Bought other products as well.